I’ve always taken an interest in things that people don’t believe in. Mythical creatures, horoscopes, ghosts, magic, parallel universes, etc. One thing that hypnotized me as child was my book of faeries. It actually didn’t belong to me per se. I think it was my mom’s or my grandma’s or something but I’m just going to consider it mine. Kind of like that book that praises Hitler that I found in my grandma’s house. That’s definitely mine now. Much like my post about Merfolk, I’m going to take a moment to educate my readers on the subject of faeries. A lot of this information is a combination of what other people have recorded and some of what I imagine to be true. 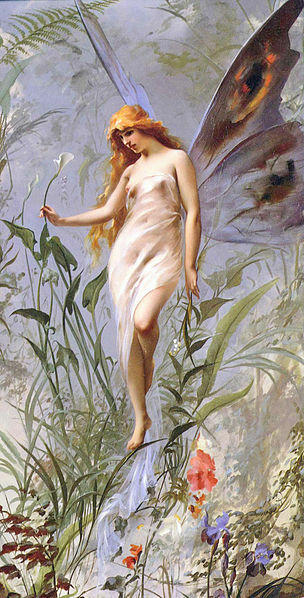 The term faerie can be used to describe a number of different legendary creatures such as goblins or trolls, but typically it’s meant for pixie-type beings. I imagine faeries residing on English isles like Jersey, Guernsey, Man, and Wight. I had a friend who lived on Guernsey and I told her that I always pictured it to be a “magical faerie land” (I really said that) and she told me that it really is. I knew it. Although faeries are found in and throughout many European country’s histories, I always imagine them solely in the United Kingdom. I can see trolls and elves in Scandinavia and Germany though. Mostly because Germans and Scandinavians look like trolls. Faeries spend most of their time hiding from humans. I guess this is one of the reasons I took a particular interest in them. I too like hiding from humans. I picture faeries to be quick, spritely little things. Some have been sketched with wings (like those of butterflies or insects) but others seem to rely on magic or other animals to fly. Much like mermaids, faeries’ looks can be deceiving. They are known to bite and are able to cast charms and play tricks on people. Ways of reversing a faerie spell: ringing church bells, running water, four leaf clovers, or St. John’s wort. Basically anything that you won’t ever come across in your life. Except running water. If you’ve never come across running water then you probably live in Africa. I can pretty much guarantee that you won’t see any faeries in Africa. You might see a zebra though. I’m now going to list some of my favorite creatures that I’ve come across in my Faeries book by Brian Froud. Jenny Greenteeth: A river hag who lures children into rivers and ponds to drown them. Jenny Greenteeth was the inspiration for Meg Mucklebones in Ridley Scott’s Legend. That movie is worth a watch mainly because Tim Curry plays the Lord of Darkness, the heroine’s name is Princess Lili, and there’s a unicorn. And Tom Cruise. Selkies: Mythological creatures that live as seals in the water and shed their animal skin to become humans on land. Don’t pretend it wouldn’t be awesome to be a seal. 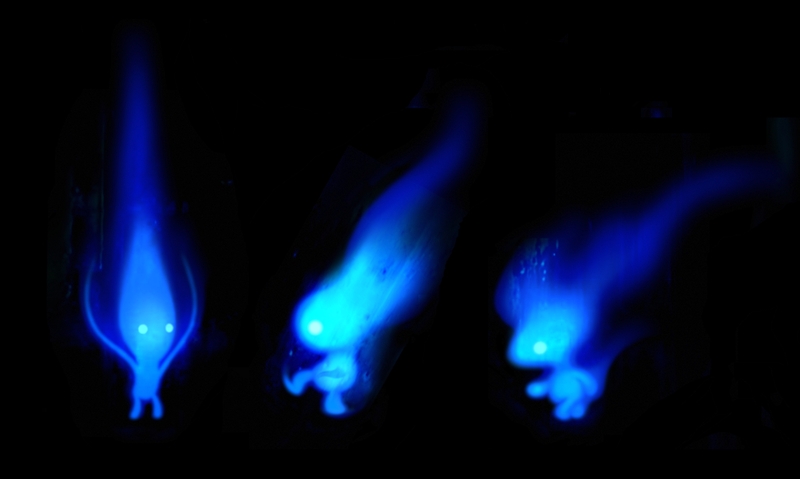 Will o’ the Wisp: This is more of a phenomenon, but it’s still cool. Will o’ the Wisps are flickering lights that are found deep in forests around bogs or marshes to lure travelers from their safe paths. I don’t know how many of you saw Disney’s Brave, but Wisps made an appearance. Unfortunately they were made to look and act like beings more than a simple light. Leave it to Disney to mess everything up. NOT what wisps look like. Brownies: Kind of like a hobgoblin, brownies live in human households and help with tasks at night in exchange for small gifts. I wish I had two brownies in my house. The chocolate kind and the goblin kind. I was talking to one of my blogging friends, Mooselicker. Maybe you’ve heard of him? He asked me which TV or movie couple I would compare Paul and myself to. What an awesome question. I couldn’t come up with anything right away, so think of this entire post as your answer, Moosey goose (sorry, never again). I asked my family to help me think of an identical couple to Paul and I, but they only came up with dumb ideas usually resulting in me being Renee’ Zellweger. Like, just no. Either Paul was Hugh Grant, Colin Firth, or Tom Cruise and I was Renee’. In what way is that fair? I said Tom Hanks and Wilson from Cast Away, which I think was a pretty good fit. I’d be Wilson, obvs. But then I mentioned Cam and Mitch and everyone ignored me because our food was served. The more I thought about it, the more it seemed like a perfect match. Except that they’re both gay men. Minor detail. Cameron Tucker and Mitchell Pritchett are the perfect couple in my eyes. 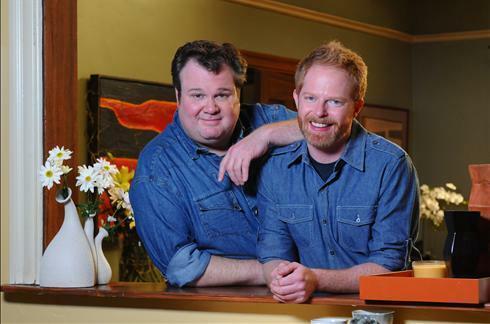 They don’t always get along, but they make things work and they’re consistently the best part of Modern Family. Kind of like how Paul and I are the best part of the world. They’re the definition of the phrase “opposites attract”. They balance each other out. The only difference is that Paul's not a ginger. And I'm not a large man. Mitch is mild, yet sometimes tightly spun. He’s a lawyer and Paul is going to be a lawyer! He loves Costco and Paul loves Costco! In older episodes Mitch mentions that he likes ice skating, musical theater, and building things. Guess what, guys? Paul likes doing all of those things too! Did I marry a gay man? Possibly. Mitch was also nervous about raising a child. I’m not saying that Paul’s nervous about child-raising, but he definitely is. He’s responsible, level headed, and always makes fun of me and my dumb ways. In the exact same way that Mitch makes fun of Cam. Cameron has a very bubbly, outgoing personality. Being slightly over-dramatic, like myself, he contrasts Mitch perfectly. Cam has lot of unusual interests. We don’t share the same hobbies, per se, but my interests are also unique and diverse. He’s a stay at home dad, and I’m basically a stay at home mom. Besides the whole “mothering” thing. Cam is definitely the woman of the relationship. Like all good women, he’s sensitive. I distinctly remember a scene from Modern Family where Cam and his adoptive daughter, Lily ( I KNOW), are having fun baking in the kitchen. He makes a mess and then walks away. Mitch complains about how Cam has all the fun and how he leaves all the cleaning up for Mitch. After that, Cam pretends to clean up but doesn’t actually do anything. So yeah. That’s Paul and I in a nutshell. Which TV or movie couple have a similar relationship to yours?